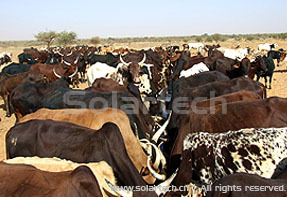 Introduction：Mali is the second largest country in West Africa, its north border lies in the heart of Sahara Desert, 80% of its population are farmers, agriculture and livestock breeding are the main pillars of the country’s economy. 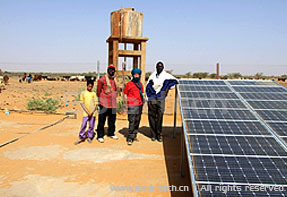 Access to stable and affordable water resources has become the key of sustainable development of Mali. 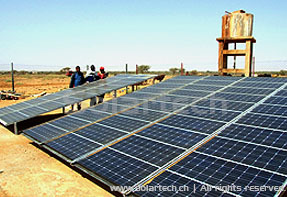 Solution:In 2012, Solartech PB7500H solar pumping inverter was installed in this project, working with solar array and pump, the system provides sufficient drinking water for the local herdsman and their livestock in the desert. It guarantees the scale of the desert farm. 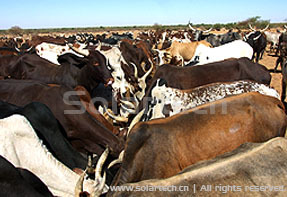 Solartech combines solar power generation with livestock breeding, it can ensure the sustainable agriculture development of Mali, also promotes the south-south cooperation between Mali and China, aims at achieving the UN Millennium Development Goals. Economic Benefits: 26,630kWh of electricity generated annually; 250 tons of coal saving in its 25-year service life; 110 tons of CO2, 5 tons of SO2, 4 tons of smoke and 65 tons of ash reductions in its 25-year service life. 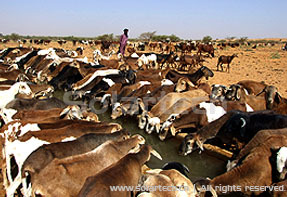 According to World Development Indicators 2013 published by World Bank, every cubic meter of water consumption could contribute 1 USD to Mali GDP. 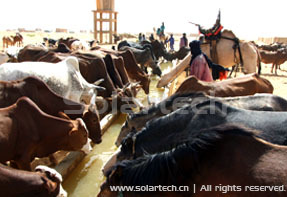 In the system 25-year service life, every cubic meter of water produced by solar water pump could contribule 1USD to Mali livestock breeding industry.